For many of us, the schools that we grew up in are part of our childhood memories. They are places where we were educated, introduced to life beyond our family and met teachers and classmates that influenced our lives. In the early twentieth century, when education was limited to the privileged few and unlike today, Nan Hwa Girls' School was first established by Mr Xiong Shangfu on 14th June 1917. His primary aim was to provide girls in Singapore with the opportunity of an education. His vision took shape with a makeshift school campus in Coleman Street and started out with an enrolment of less than hundred Chinese girls (from less than hundred students initially, our school population has now grown to 1000!) More girls enrolled in the school and this created a need for a bigger campus at Bencoolen Street in 1921. With a booming student population over a period of twenty years, another shift to a bigger, newer campus (the photograph of the original school campus is what you see above!) was necessary in 1941. 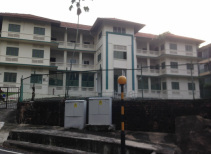 The new campus was forced to close down when the Japanese invaded Singapore and used the school grounds as the headquarters for the Japanese Imperial Army. In October 1945, with the return of the British and financial support from parents and funds raised, the school was reopened and its enrolment rose to 700. It was during this period of the mid 1950s that our school changed its name to Nan Hwa Girls' High School and was one of the premier girls' schools in Singapore. The momentous change for our school took place in 1984 when the school began to admit Secondary One boys and by then, the intake of primary school students was terminated. To mark the significant change, the name of our school was changed to Nan Hua Secondary School. Since the 1960s, not just Nan Hua Secondary School, but many of the other old schools in Singapore were moved out of the city centre and relocated into the new towns, where the population was re-housed. In 1982, the school moved from the campus in town to Clementi Avenue 1 and in 2003, was relocated to 41 Clementi Avenue 1 where we stand today. In 2006, as the school had achieved its Autonomous Status, the name of the school was changed to Nan Hua High School. Your Task - Discover it! Nan Hwa Girls' School moved from Bencoolen Street to a campus in town, near to Old School at Mount Sophia. The original main campus building is still present in Singapore today (look how similar it looks to the past in the photograph on your left!). Using the clues given and with the help of google map app on your ipad, find the address of the campus and the walking distance from our current location to the original school campus. Capture your end product on google maps as an image on your ipad.